There are races you train for. There are races that become checked off your bucket list. There are races you travel to. There are races to be accomplished for all different reasons. This one here, at Disneyland this past November was all about finishing ahead of the balloon lady and taking in all the support around me. Back in early July, while running on vacation with friends at their lake house, I felt a pain in my left foot. My right foot is the one with a naricula, or an accessory bone, and has caused me pain prior. This was new. This was unexpected. This took me out of the game until a week and a half prior to the Avenger’s half. My diagnosis: PTTD Posterior Tibial Tendinitis Disorder. AKA overuse!!! 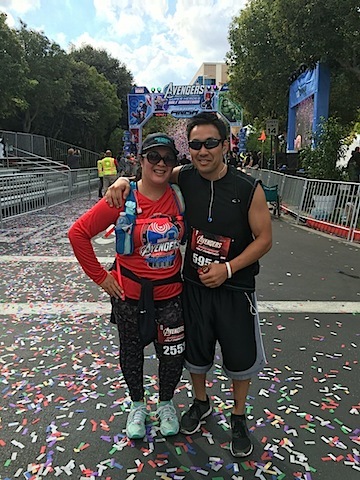 After 3 weeks into Marathon training…my running came to a halt. I started PT late August…My PT gave me clearance to start run/walking intervals at the track of 30 seconds walking to 1 minute of LIGHT jogging for a total of 10 minutes. Up to 3 days a week. My brother, said no matter if we crawl, I am right here alongside you. Aside from my first half, this is my absolute favorite race to date!!! Scrapbooking & Beyond, Fall 2011 | "San Francisco"
Scrapbooking & Beyond, Fall 2011 | "A View From The Top"
Scrapbooking & Beyond, Summer 2011 | "Our Beautiful Girl"
Scrapbooking & Beyond, Winter 2011 "Twice Blessed"
Scrapbooking & Beyond, Fall 2011 | "Notre Dame"
Scrapbooking & Beyond, Fall 2011 | "Eiffel Beauty"